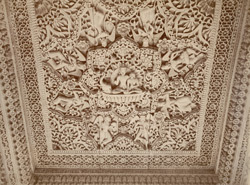 Detail of carved ceiling from a pavilion at Rajsamand Lake from the 'Reading Collection: Views of Udaipur' taken by an unknown photographer c.1910. The photograph is part of an album containing architectural and topographical views of sites in Rajasthan, mainly of Udaipur, originally in the collection of Rufus Daniel Isaacs, Lord Reading, who served as Viceroy of India (1921-1926). Rajsamand Lake, an artificial lake 56 km north of Udaipur was built by Maharana Raj Singh I (r. 1652-1680) between 1662-1676. Nauchowki embankment in the north, is ornamented with nine marble pavilions. It is the ceiling of one of these pavilions pictured here, showing details of scrollwork, flowers and scenes from the life of Krishna.